Critics of President Donald Trump shredded his first public comments of California’s most recent wildfires on Saturday, denouncing both the cruelty of a victim-blaming tweet he posted and the president’s active curtailing of efforts to curb the climate crisis, which has exacerbated extreme events like the fires. Trump threatened early Saturday morning to end federal support for California’s efforts to fight wildfires like the ones raging in the northern part of the state as well as near Los Angeles, scolding the state for what he deemed poor forest management. The president’s tweet came hours after he declared a state of emergency in California, opening up federal funds to help local and state officials battle the Camp Fire in the northern town of Paradise as well as the Woolsey and Hill Fires in the south. 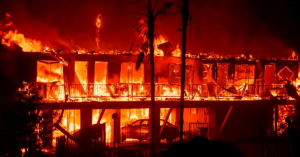 It also followed reports that at least nine people have been killed by the Camp Fire, now the most destructive blaze in the state’s history. More than 50,000 people have been forced to evacuate due to the fire and more than 6,700 buildings have been destroyed—including more than 80 percent of the homes in one town. In Southern California, more than 200,000 residents have had to evacuate due to the fires raging near Los Angeles. Several critics condemned the president for ignoring the reality of the climate crisis, as he has during other extreme weather events—while taking direct action to stop national and global efforts to curb the carbon emissions that have contributed to the planet’s rising temperature and the resulting hurricanes, droughts, and wildfires. “While California’s climate has always been fire-prone, the link between climate change and bigger fires is inextricable,” wrote Kendra Pierre-Louis at the New York Times. This is such an ugly thing for anyone to say let alone the top person whose duty it is to protect & defend Americans. Blaming this on forest management but not climate change is like blaming hand soap for the flu instead of the virus. As he did last summer as fires raged in the state and elsewhere in the West, Trump alluded to forest management reforms in California as the solution to wildfires—comments which critics have said are the president’s way of lobbying for forests to be opened up to the logging industry. As Common Dreams reported in August after Trump’s earlier comments on wildfires, experts say cutting down more trees would do little to help California avoid blazes like ones that have swept through the state this week.